We have mentioned about taking millet diet in the article "Can You Control a Baby's Gender? ", and then we received hundreds of inquiries about millet and its cooking technique. 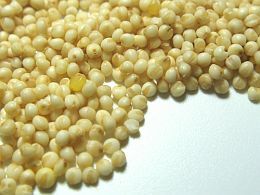 There are about 12 kinds of millets sold here in our nearby market in Osaka. These two photos are the commonly known varieties, although I do not know their names. 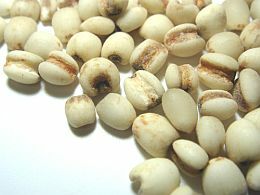 Below two photos are the imported varieties from Southeast Asian countries. Although millet is often considered a bird feed, it is generally used as human food. Millets are packed full of nutrients. It comes in various shapes and colors, but it's commonly available as pearled and hulled in nearby stores. Millet contains various mineral nutrients such as manganese, tryptophan, magnesium, and phosphorus, with high calories. A cup of cooked millet provides 26.4% of the daily value for magnesium and 24% daily value for phosphorus. Like all other grains, rinse millet thoroughly under running water. Add 1 part of millet to 2½ parts boiling water. You can add broth to taste. When the water is absorbed, turn down the heat, cover and simmer for about 30 minutes. When it's finished, you'll get soft and light grains like rice. If you want the millet to be creamier, stir it frequently, and add a little extra liquid during cooking, and you'll get a dish that resembles rice porridge or mashed potatoes. You can add any flavor to it. For a crispy texture, you can roast the millet grain before boiling. You can add some vegetables, chicken, and any other beans to have highly acceptable taste and aroma. Millet makes a delicious alternative to rice, potatoes, and oats. You can grind the millet and mix it with baking powder for your breakfast bread. You can also use the grinded millet together with some seasoned-flavored fruits to make cake. Millet is more than any alternative to the common grains because of its valuable nutrients. 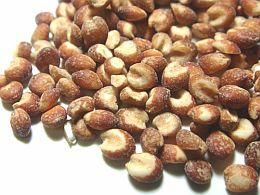 Millet is known to protect your heart by lowering cholesterol contents in the blood. Millet is also recommended for asthma and migraine patients. 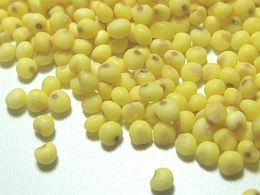 Millet is known as brain rejuvenator in Japan. Is it true that people who ate millet during the World War II are more talented? This is a comparison with today's young generation eating lots of junk foods. Someone told us that a millet diet can prevent gallstone as well as breast cancer and some cancerous diseases. Now isn't that good news?